A common puzzle consists of a chain of wooden cubes held together by string, which can be folded up into a 3x3x3 cube. 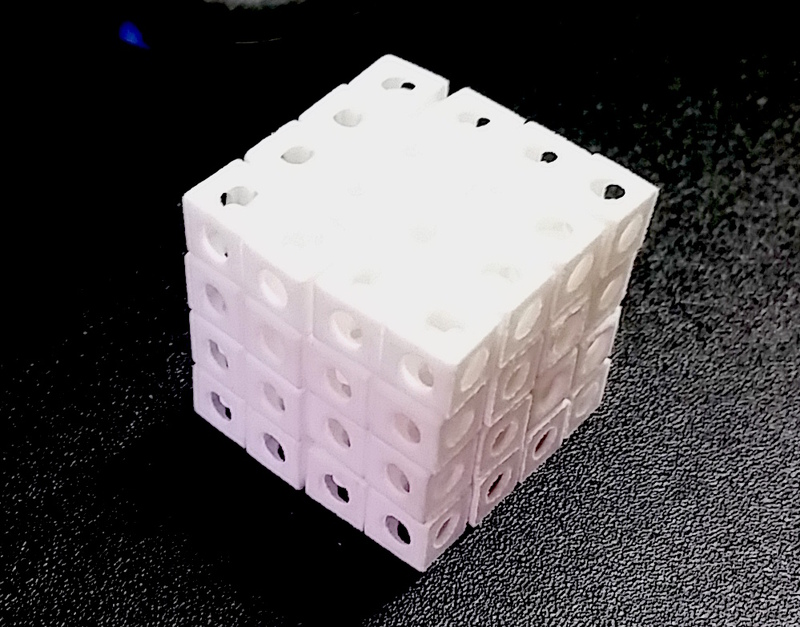 It occurred to me that the backbite sampling algorithm for Hamiltonian paths could be used to generate such puzzles, even for large cubes, which could be then created using a 3d printer. The idea is that after the design has been worked out, then it would be possible to print an essentially unbounded number of unique puzzles. i.e. anyone could buy or print their own unique puzzle. 4x4x4 Hamiltonian path puzzle in the process of being solved. 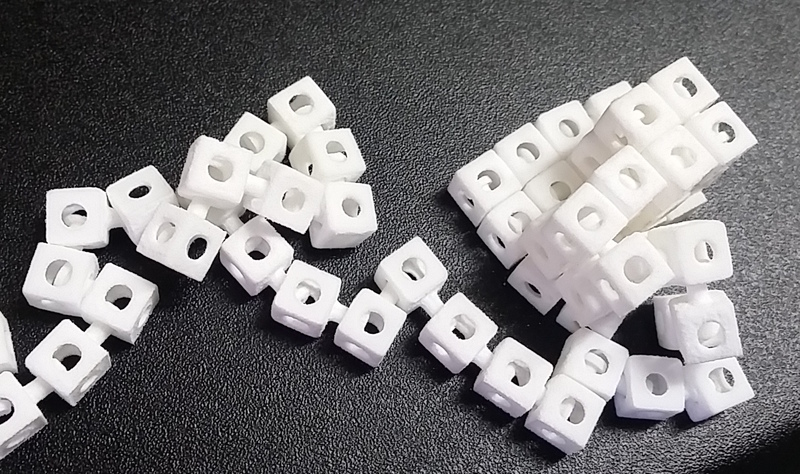 There are a few issues here: 3d printing is expensive and so one needs to minimize the volume of the puzzle, interlocking parts are necessary to get it to work which means that the technique used by home 3d printers - fused deposition - is ineffective and one must use a commercial 3d printer which uses laser sintering. N.B., parts could be printed separately and then assembled, but I think it is nice to avoid this, and anyway by making the puzzle a single piece then it cannot be altered and hence will remain unique. Solved version of 4x4x4 Hamiltonian path puzzle. It's about 2.8cm per side. I've recently designed my first prototype, using a C implementation of the efficient version of the backbite algorithm, then a blender+python script to produce the stl file for printing, and then printing it using the commercial 3d printing service Shapeways. The puzzle I chose to print is a walk in a 4x4x4 cube. It works and looks pretty good, but it is not a satisfying puzzle for me, as it is too fiddly and difficult to solve due to the excessive flexibility of the chain. Hamiltonian circuit on a 4x4x4 grid, printed by Shapeways. It's about 1.8cm per side. Prototype 2, which will involve an internal snap-lock mechanism to create some stiffness, is almost ready for printing. If this is of interest to you, please let me know! I'd be rapt to be able to share ideas. If you're interested in a printed puzzle of your very own that would be great too. 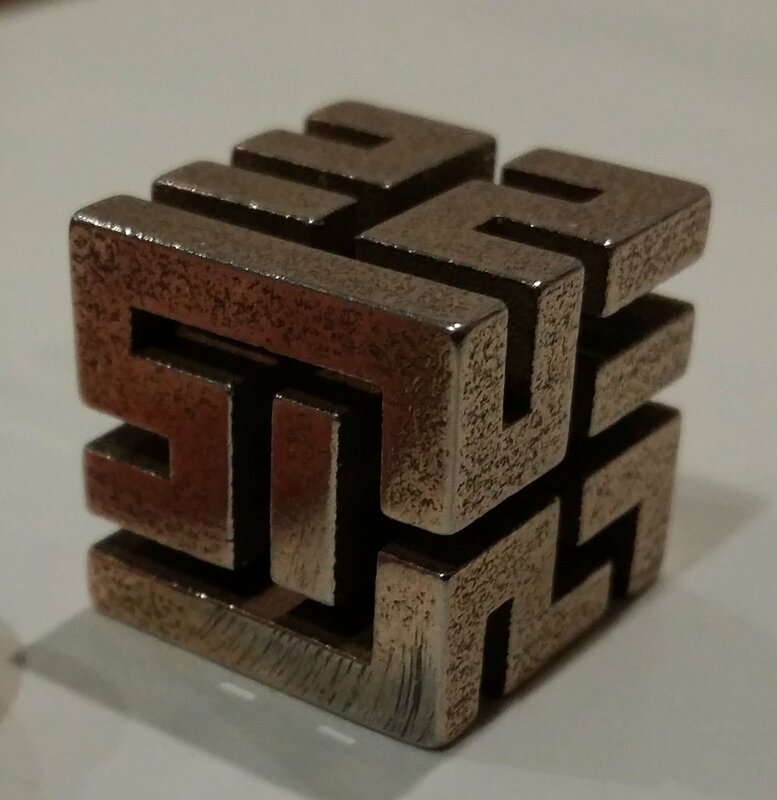 In the same vein, I've included a photo of a Hamiltonian circuit on a 4x4x4 grid sampled via the backbite algorithm, and printed in steel by Shapeways.